GPRS’s office in Phoenix, Arizona was hired by a client to locate utilities outside of a small strip mall in Tucson, AZ. The contractor at the site was needing to cut the asphalt and excavate for the installation of a new gas line to a pizza store that was being built inside a vacant tenant space. All of the utilities for this entire strip mall entered through the back of the plaza where they were wanting to install the new gas line. This was a very busy area with all utilities running through the location of there trench. GPRS was able to direct connect to all of the power conduits to trace them out along with water and communication lines. One everything was located with the RD 7000, we then used the GPR to locate some more unknown lines and to give depths for all of the other utilities that we were able to locate. The work we did here was very helpful for the contractor to keep the project running smoothly without having additional cost to fix unknown utilities that they would have cut through. Along with marking all findings on the ground with either pin flags or paint, GPRS also offers a service of collecting all the findings with a GPS and putting it into a google earth overlay or CAD for future reference. We can typically have the google earth overlay to the customer in 3 to 4 business days. If you are interested in learning more about our concrete imaging capabilities or other Ground Penetrating Radar applications such as locating Utilities and sub-surface anomalies along a proposed pipeline trench, locating Underground Storage Tanks (USTs), clearing boring locations of possible Utilities for soil samples, Void Detection or even structural investigations. Don’t hesitate to contact us for more information or to hire us for your next project no matter how big or small the project may be. 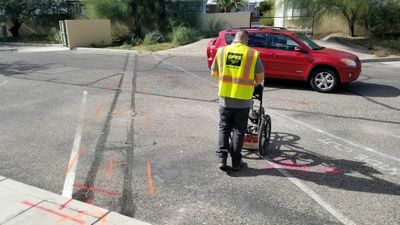 Ground Penetrating Radar Systems has an office local in Phoenix serving all of Arizona and as well as having offices all across the U.S in all major cities and states. Please feel free to contact Troy Bullock at (480) 493-6157 or email him at troy.bullock@gprsinc.com.